Hugues Merle, born in southeast region of France, was a talented painter known for his idealized and sentimental genre themes, which were prominent during the middle of the nineteenth-century. Merle was accepted as a student at the École des Beaux-Arts in Paris, where he enrolled in the studio of Léon Cogniet (1784-1880). Works from early in Merle’s career reflect Cogniet’s influence. Many of his paintings were politically-charged pro‐Empire historical narratives or mythological history paintings — the kind that students at the École were trained to produce. Later in his career, Merle developed his own painting style that distanced him from Cogniet. He transitioned away from heroic scenes that appealed to aristocratic tastes or political agendas, and began to paint for the upwardly mobile French middle classes. Merle painted images of domestic family life and narratives celebrating traditional French values. Rather than multi-figured scenes, he began to fill his canvas with one of two figures. As the figures grew, sometimes larger than life, they became more idealized with an emphasis on line over color. He began exhibiting at the Salon in 1848 with remarkable success. He was awarded second-class medals in 1861 and 1863, and in 1866 he was made Chevalier of the Legion of Honor. Since the Salons attracted over 300,000 people annually, they provided valuable exposure to exhibited artists. Merle’s achievements in the Salons of the 1860s provided him international recognition, particularly with American collectors. He built a very lucrative business painting portraits for the British and the Americans, and became known for his work as an interpreter of major literary romantic figures. Nathaniel Hawthorne, upon seeing a photo of Merle’s interpretation of the Scarlett Letter, is purported to have said: “It is the most true representation of my work I have ever seen.” Although Merle did not win the coveted Prix de Rome, he had the distinguished honor of entering the competition in 1849. 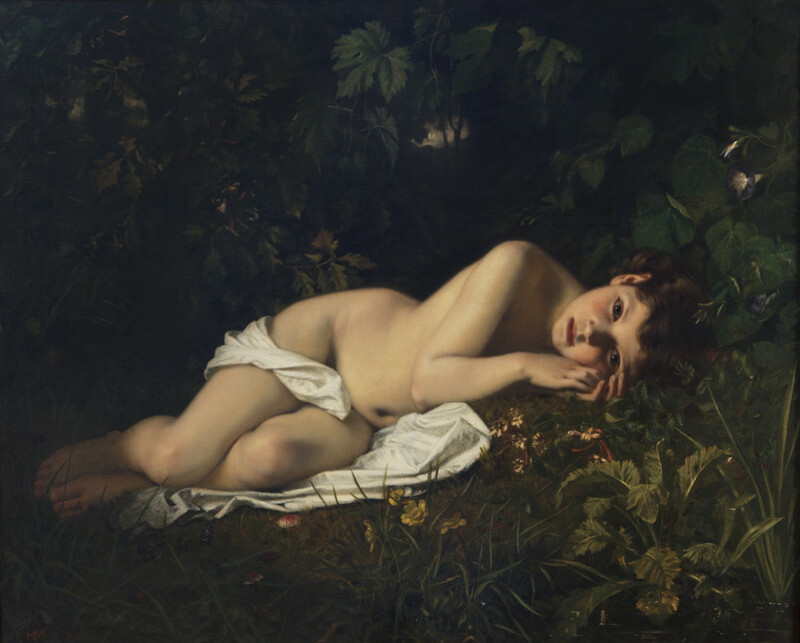 Merle is often compared to William Bouguereau. Born two years apart, they both graduated from the École de Beaux-Arts, were members of the French Academy and regularly exhibited at the annual Paris Salon. Their mutual fascination with mythical, allegorical and literary scenes, combined with their mastery of the human figure, made them competitors for the same pupils, positions, prizes and patrons.